Phew guys, many, several days up in the forest with full on activities which the young folks perceive to be dangerous but which obviously aren’t at all, as we’re on hand and the risk assessing is spot on! and yes we do use axes and other sharp edged tools to carry out all manner of activities around our camp site up in the forest – splitting wood for the fire, everyone has a go! using cutting edges to make feather sticks to quicken the fires initial development, making their own fires to brew hot drinks, learning about knots to help out in their shelter and den making pre-occupations, swinging from ropes across ‘the swamp’ area, climbing trees, running the forest trail to hide-and-seek using walkie-talkies, making bows, arrows and catapults to hold shooting competitions with, making pizzas from scratch and baking them over the fires – wow, true Swallows and Amazons stuff, just see from the pictures folks! WildWood – Dangerous Days for Sons & Daughters – bow competition time! WildWood – Dangerous Days for Sons & Daughters – hunkering down in the log store for a pizza break! WildWood – Dangerous Days for Sons & Daughters – one successful tarp shelter constructed by the chaps themselves! WildWood – Dangerous Days for Sons & Daughters – learning to use a fire striker! WildWood – Dangerous Days for Sons & Daughters – putting out forest trail signs for the other group to follow! WildWood – Dangerous Days for Sons & Daughters – look at my own made catapult! WildWood – Dangerous Days for Sons & Daughters – chill-out time away from the crowd! WildWood – Dangerous Days for Sons & Daughters – learning to use the old timers method of spark creation, true flint n steel! WildWood – Dangerous Days for Sons & Daughters – more learning & hands-on knowledge about fire lighting safely and the ‘feeding’ of the fire to achieve a rolling boil! WildWood – Dangerous Days for Sons & Daughters – pea-shooters from elder, cut, selected and fashioned by them! WildWood – Dangerous Days for Sons & Daughters – girl power archery! WildWood – Dangerous Days for Sons & Daughters – splitting wood for the fire pit, carefully mastering the art of billhook and mallet use, to split a billet! Wow folks, we popped over to a Georgian House and parkland, nestled between the areas of North Wales, Shropshire and Cheshire to create a Nerf ‘battleground’ deep in their forests; having set up just in time, we were joined by some twenty plus young folks of differing ages ready and eager to do battle! First up was the choosing of two teams, then making their pennant flags with a team logo designed upon it, then using charred corks they set about ‘camming-up’ and then each team had their scariest war-faces photo’d! WildWood Nerf Party – scary war-faces, all cammoed-up! With flag completed for attaching to their team standards. Next up it was over to the temporary Ranges to hone their shooting skills and familiarising themselves with their weapons of choice, they shot from the firing line in differing positions: prone, kneeling, behind cover and standing. Once happy it was back around the camp-fire whilst they drank their hot chocolate drink and discussed team tactics for the forthcoming ‘battles’. WildWood Nerf Party – the teams enjoying their hot chocolate and chatting team tactics! The teams then used poles, ropes, bungees, string, tarps and stakes to make their own barricade defences across the ‘mined no man’s land’. Once constructed and fully loaded, the whistle sounded for the battling to commence! WildWood Nerf Party – the long view down the battle-field! WildWood Nerf Party – we were impressed by this younger chap, he really thought he was in the thick of it! WildWood Nerf Party – reloading behind cover, before the assault forward! WildWood Nerf Party – battling from cover behind the barricades! Around an hour and a half later, ‘the chaps n chapesses’ were flagging with an even score of battles won! So the decider had to be a Mexican Stand Off, final shoot out between the teams until all the rounds were loosed and those hit totted up! All still smiling away, the groups gathered back around the camp fire to toast some marshmallows, some managed to do five at a time on their whittled sticks! Thanks for inviting us over to your place folks, we really enjoyed our change of venue for the day, see you all again soon! WildWood Art & Craft Days – colours and shapes in a frame! WildWood Arts & Crafts Days – the bearded man’s ace! WildWood Arts & Craft Days – a 3D shape in the construction/concept early thoughts stage! WildWood Arts & Craft Days – the tower taking shape nicely! WildWood Arts & Craft Days – the framed tree from trees! WildWood Arts & Craft Days – the beginning ideas for the tower base underway! WildWood Forest Art & Craft days – an Andy Goldsworthy inspired piece! An eager bunch of eight year olds yomped up to our clearing in the forest and having chosen their three groups, settled down to creating a team flag for their own camp. WildWood’s Swallows & Amazons party – learning to use the fire striker! Once that was carried out the guys began the learning process for fire making; first up they became familiar with the use of a ferrocerium rod and how to safely strike the rod to produce a usable spark, then they practiced further by igniting a small piece of cotton-wool. Then it was off to find dry kindling and tinder, not an easy task, it having rained heavily the evening before! Once readied with their fuel, the intricacies of the furnace kettle workings and safety pointers were demonstrated: then it was over to the folks to fill their kettles and get boiling. WildWood’s Swallows & Amazons party – carefully adding fuel to the furnace kettles! Meanwhile in pairs, they got to use an axe and chop up billets of wood for the main open fire – oh did they love this! WildWood’s Swallows & Amazons party – whacking the axe home to split firewood! Once the kettles boiled, they made their own hot chocolate drink and then it was off to set up their own shelters and camp area. An hour later, they were al around the main fire, munching their hotdogs and chatting away about whose den was the best. WildWood’s Swallows & Amazons party – hotdogs around the open fire! After a little more time on their camp areas, it was back to the central fire for the toasting of marshmallows and then they were heading back along the forest trails as the light faded! Thanks for coming folks and see you all again soon! WildWood Half Term sessions – group learning, spark creation! WildWood Half Term sessions – individual spark creation, increasing self reliance! WildWood half Term sessions – getting to grips with how the feel of the ferrocerium rod is! WildWood Half Term sessions – the initial group watch n learn activity, a focusing on what is going on, so questions and good learning! WildWood Half Term sessions – more perseverance with the ferrocerium rod! WildWood Half Term sessions – and the swords in action! WildWood Half Term sessions – using peelers to bark strip the wood down for smoother surfaces! WildWood Half term sessions – removing the interior pith of the elder sticks to create pea-shooters! WildWood half term sessions – more hammering away in the construction phase! WildWood Half Term sessions – making and shooting their bows! Wow our half term holiday sessions got off to a flying start this week with a couple of days of making items with woodland products to hand in our forest; these photos give you a taste of what we’ve been up to! WildWood Half term sessions – the making of the tractor! WildWood Robin Hood Bow Making Party – proud makers! all of course whilst laughing and joking along together infront of the warming open fire. They learnt some knew methods of frapping, lashing and wrapping cordages to the bow making processes! WildWood Robin Hood Bow Making Party – lashing method for hand grip on the bow! After all that it was definitely time for a well earned mug of hot chocolate and then it was onto making the arrows. So straightening a thinner section of willow, warming, heating and bending; adding on some designs and the flight feathers with more binding skills. WildWood Robin Hood Bow Making Party – drawing the bow strings to flex the bow having strung it! Finally it was back to the campsite for some party foodstuffs and the toasting of mallows over the coals! Thanks for coming folks, see you all again soon! More fun, exertion, problem-solving, running the forest trails, team-work to encounter, think through and overcome the challenges set before them as the teams progressed through the woodland 🙂 The guys yomped up to the clearing through the woods, having decided upon Captains, squad members, applied cammo and taken charge of the kit to be carried at all times AND NOT TO BE PUT DOWN-EVER! WildWood ‘Army’ Obstacle Challenge Party – cammo applied, war faces screaming and about to head off to their tasks in the forest! The two teams began their tasks, one heading off through the woodland to negotiate the balance beams, the wind blown trees across the paths, the hurdles to go over n under, the alarmed ‘razor-wire’, the ‘mine-field’, the tarps to be crawled under, the ‘barbed wire’ crawl, the tyres to get over, the strap line crossing over the ‘canyon-of-doom’ and many more tasks and the second team creating a water tight shelter! WildWood ‘Army’ Obstacle Challenge Party – crawling under the ‘barbed-wire’ challenge! As the first team headed back into the clearing a bucket of water was chucked over the team huddling within their shelter! A quick hot mug of chocolate was gulped down before the teams swopped over challenges! WildWood ‘Army’ Obstacle Challenge Party – team working to complete their chosen shelter construction design! WildWood ‘Army’ Obstacle Challenge Party – the last task, a successful Nerf single shot at the NATO target, heart pounding, after the HILL run! Once back the winners were declared and the party foodstuffs wolfed down, before finishing off by toasting marshmallows! Thanks for coming folks, glad you enjoyed it soooooo:) much and thanks for the really nice emailed positive feedback, see you again soon! 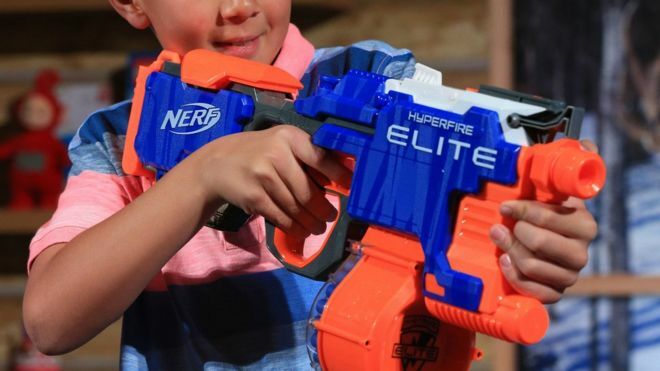 WildWood has always provided protective eye wear – Important NHS advice about Nerf Gun use! Wow superb skills both of the mind and physically for these six year old chaps who yomped up into our forest setting. After choosing Captains, selecting team mates, naming teams and applying cammo for their ‘war-faces’ the challenge was on! The first team had to build a water tight shelter, tested with a bucket of water and then they learned how to create a spark using a ferrocerium rod & striker whilst the other team set off on their obstacle challenge: ‘razor-wire’ negotiation, balance beam walking, crossing the ‘Canyon-of-Doom’, under fallen tree trunks along the trail, carefully getting the team across the ‘mine-field’, climbing over tree sections, crawling under tarps uphill, in and out of tyres, prone single shot shooting at the NATO target with a Nerf Gun, swinging over the stream and loads more – all whilst carrying ‘the blue thing’ and not allowing it to touch the forest floor at any time. Phew great effort guys, well worth the hot dogs, marshmallow toasting, cakes, buns etc. Thanks for coming, see you all again soon! WildWood ‘Army’ Obstacle Challenge Party – the ‘war-cry’! before heading off along the forest obstacle trail! WildWood ‘Army’ Obstacle Challenge Party – spark creation learning using a ferrocerium rod & striker to ignite the cotton pad! WildWood ‘Army Obstacle Challenge Party – nerf gun skills test! WildWood Army Obstacle Challenge – passing the ‘carry-item’ over the alarmed trip-wires! WildWood Army Obstacle Challenge – balancing over the beams over the ‘bubbling, stinking swamp area’! WildWood Army Obstacle Challenge – hold on tight guys, ‘canyon-of-doom’ below!